We produce enough food to feed 10 billion people, yet 1 billion are still hungry. Effective food re-distribution is the solution. When we hear about world hunger still being a problem the contradiction of producing excess is a bit embarrassing. The excess food in some regions of the world leads to about 1.3 billion tons of food wasted or lost annually. Can't grasp this quantity? 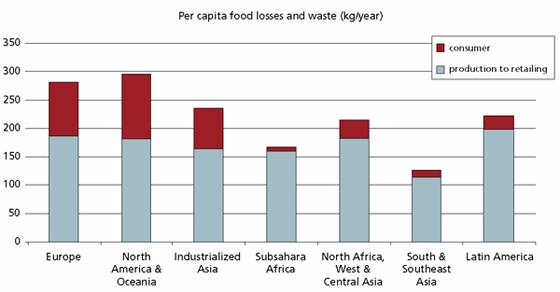 Per capita, this is 95-115 kilograms of food wastage by those in Europe and North America, but only 6-11 kilograms in sub-Saharan Africa, and Southeast Asia. Most jarring fact of it all is that most of the waste from the developed countries is perfectly good, nutritious food. This Spanish app is about posting photos of food you don't want anymore, as well as the location of pickup, allowing users to swap food instead of throwing it away. This app alerts shoppers when food in supermarkets is about to expire or get thrown out, encouraging users to buy it or pick it up for free. The app shows discounted menu items of restaurants right before they close, around 11PM in Singapore. This app lets charities in the UK and Ireland know when there is a surplus of food in supermarkets and farms, the surplus is donated. This app is for European commercial kitchens. Kitchens can track how much food is wasted from each meal and adapt portion sizes accordingly. This particularly useful for commercial use as companies could save a lot of money by reducing waste. If your geography is not listed, surely there is a local initiative or app to help you do your part. So open your app store, find the right app, and start saving food from going to the landfill, your pocket will be grateful for it too.